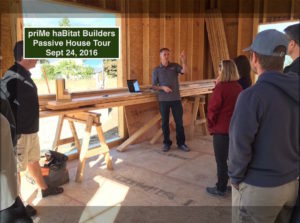 Our Successful Passive House Tour: Sept 24th, 2016! Green Building, Net Zero and Passive House discussions at the Kelowna Passive House Construction Tour! We are so pleased to have had such an engaging, interested, knowledgeable and fun group at our first Kelowna Passive House Tour. Great questions about Green building and sustainable construction. The comments and thoughts from the crowd shows us how much we need to incorporate more sustainable building choices for homeowners. There is so much that we can offer right now to help control rising utility costs, lower our carbon footprint and have more quality, better-built homes. It’s here now! Contact us for more information or to talk about your options. Net Zero and Passive House Design & Build Firm serving Kelowna and the Okanagan.